Sharks are beautiful animals that have roamed our oceans since before the time of dinosaurs. But every year, millions of sharks fall victim to the horrific practice of finning. The fins of the shark are cut off and the rest of the shark is discarded in the sea to die. Together, we can stop this. Sharks are top-level predators that help maintain a balance in the marine food web. Many sharks prey on wounded or sick animals, keeping the populations of various species healthy. Others scavenge or filter-feed, keeping the ocean healthy. In most commercial fisheries, the meat of a shark has little value. The fins, however, are highly valued and are used for shark fin soup and medicinal purposes. Many sharks also are caught accidentally in nets, fishing lines, bottom trawlers and gillnets. Sharks mature late in life. Many do not start reproducing until they are 10 years or older, and many species give birth to only a few young. They can't keep up with finning and overfishing. We may lose them - and many more species we rely on for food. Is this your idea of a shark? Sharks are often portrayed as animals to be feared. In reality, our chances of being attacked by a shark are small compared to other dangers. For every fatal shark attack, up to 25 million sharks are killed by humans. Meanwhile, human fatalities from sharks average less than one person per year in the U.S. and are usually due to mistaken identity. From below, swimmers and surfers look like seals, the primary diet of some sharks. Together, we can make change. When humans work together, we can make change for good. Here’s the latest exciting progress. Sharks and rays are listed as a species in the Association of Zoos & Aquarium’s “Saving Animals From Extinction” (SAFE) campaign. This focuses the collective expertise of accredited zoos and aquariums, including Point Defiance Zoo & Aquarium, to identify the threats, develop action plans, raise new resources and engage the public in saving sharks and rays. Texas becomes the 10th US State to ban the sale of shark fin products. It joins Washington, Hawaii, California, Oregon, Illinois, Maryland, Delaware, New York, and Massachusetts. Staff members at Point Defiance Zoo & Aquarium collaborated with colleagues at Northwest Trek Wildlife Park, Woodland Park Zoo and Seattle Aquarium to educate the public about the perils facing these endangered species. Two PDZA dive staff members travel to the Socorro Islands Biosphere Preserve off the coast of Mexico to help in a crucial project to track sharks’ movements over time. The Zoo Society’s Dr. Holly Reed Wildlife Conservation Fund paid for their travel expenses and donated acoustic receivers to collect long-term data on tagged sharks. Read more in the blog. The Shark Fin Elimination Act of 2016 is introduced to Congress. While shark finning is illegal in US waters, this bill would ban the trade of shark fins in the United States. Papahanaumokuakea Marine National Monument in the Hawaiian Islands becomes the largest ecologically protected area on the planet. Measuring 582,578 square miles (1.5 million square kilometers), it's more than twice the size of Texas and is home to more than 7,000 marine species. Governor Inslee and the Washington State Legislature have approved $300,000 to fund the Washington Animal Trafficking Act for 2018-2019. This Act bans the trafficking of products from ten groups of endangered animals including sharks. The funding will allow officers to inspect more cargo, expand the K-9 detection program, develop lab testing of evidence, and apprehend traffickers. The Sustainable Shark Fisheries and Trade Act would require a nation seeking to export shark, ray, and skate products to the U.S. to receive certification from NOAA that it has management and conservation policies in place comparable to those in the U.S. This bill aims to level the playing field for U.S. fisheries and encourage other countries to support sustainable trade in sharks, skates and rays. 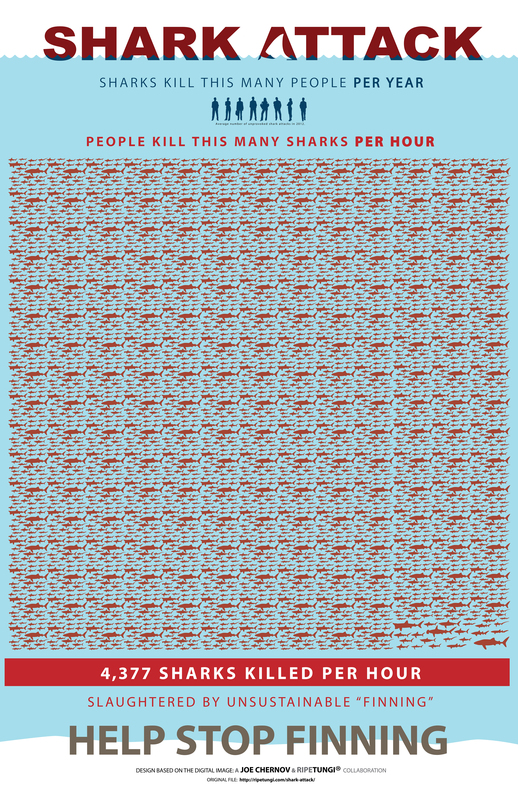 Post, print and share this image showing 4,377 reasons every hour why shark finning is still a problem. 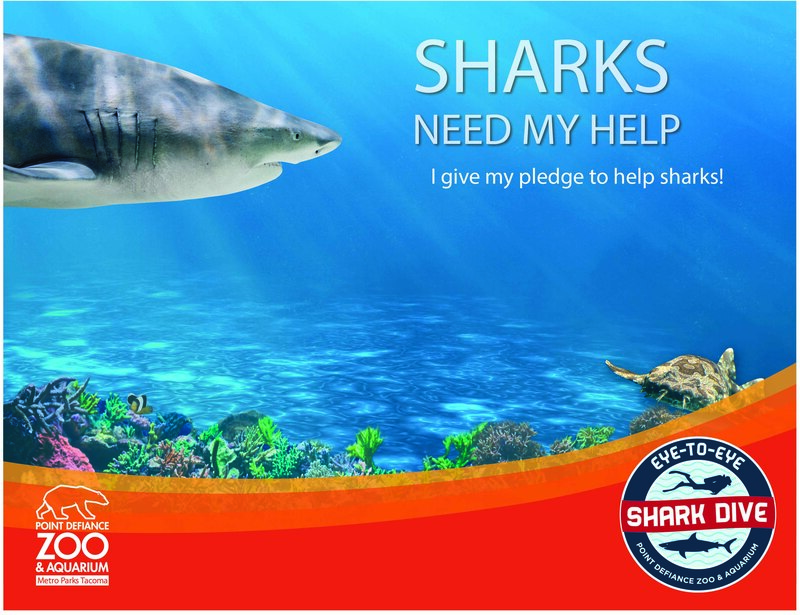 #savesharks. Use your Seafood Watch card, visit the website or download the phone app to choose sustainably-harvested seafood – a practice that avoids the unintended capture of sharks. 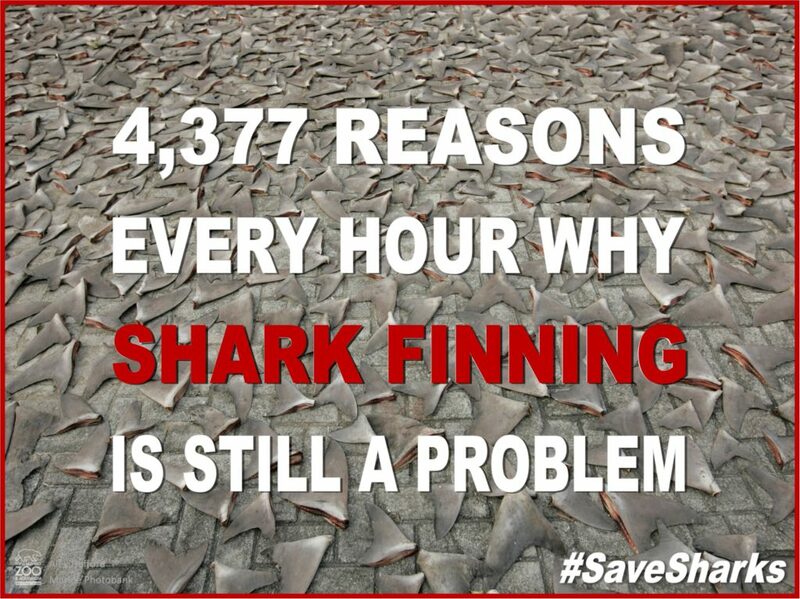 Help end shark finning. Washington State banned this gruesome practice. Tell your representatives in Congress that you want strong federal laws protecting sharks. Contact Washington Department of Fish & Wildlife to report violations of the Shark Fin Ban. Do an Eye-to-Eye Shark Dive at the Zoo and literally immerse yourself with these amazing creatures. Explore the world of sharks! Meet our 16 big sharks in the Outer Reef, and touch small sharks and rays (shark cousins) at Stingray Cove – both inside the South Pacific Aquarium. And don’t miss our scalloped hammerheads in the new Pacific Seas Aquarium!